Serbian Gold (or Leskovac) is an "apple-shaped" quince, which can be grown in most parts of the UK. Like many quinces, Serbian Gold has some ornamental value, with the wood, leaves, pink/white blossom and fruit all being attractive. The fruit should be picked towards the end of September in the UK, and then stored for 1-2 months at room temperature to ripen. Please fill in the details below and we will let you know when Serbian Gold quince trees are back in stock. Serbian Gold is in flowering group 2. Serbian Gold is self-fertile and does not need a pollination partner, although fruiting may be improved if there is a compatible tree of a different variety nearby. 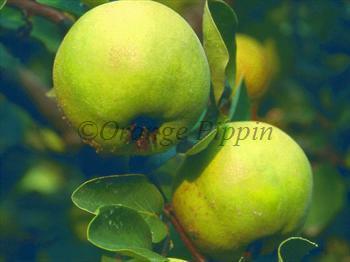 Serbian Gold is very resistant to leaf rust infections which can affect quinces. It is also is one of the hardiest of quince varieties, but even so try to plant in a sunny aspect if possible. Training against a south-facing wall is a good idea, as this will promote good quality fruit as well as being an attractive garden feature. Serbian Gold is self-fertile and no pollination partner is required. Serbian Gold is also known as Leskovac, after the town in Serbia where it may have originated. Note that Serbian Gold is not the same as the similarly-named Serbian Quince. The difference is that Serbian Gold is an "apple-shaped" quince whereas Serbian Quince is a "pear-shaped" quince.